In London there is a couple who raised a 11-year-old cat named "Tom", Tom has arthritis, thus his ability to climb or jump has been restricted greatly. The couple both worried about Tom will turn to lazy with less activity, so they design and made a spiral staircase so through the ladder cat Tom can climb over the fence of yard and to enjoy the outside world. Own such a caring master, Tom is the happiest cat in the world. Aging tabby cat can climb fence again. Adrienne Ellery's tabby cat Tom has been getting on in years. He's 11-years-old and arthritis has made his joints creaky and his bones tired. Like other elderly animals suffering from arthritis, Tom can't jump like he used to and the garden fence that blocks his passage into the wide world beyond the garden proved to be too much for him. 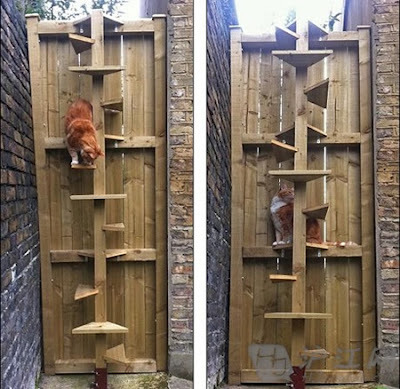 That's when Ellery's boyfriend, Gareth Bowen decided to build a spiral staircase for the impaired cat which allows him to scale the fence in steps instead of leaping it a single bound like a feline Superman. According to Ellery and Bowen, Tom learned how to use to staircase quickly which proves that cats are intelligent - a dog would never figure it out. Tom mounts the stairs daily to exercise and socialize with the neighborhood cats.